The good news: this is awesome. The bad: you’ll probably never see it in the wild. Spotify has become a firm favourite with music streamers, offering a massive catalogue of songs and albums, as well as the ability to share playlists with other users. Imagine having access to all that on your iPhone – it would make your own 16GB library of music defunct for starters. And it’s totally possible. 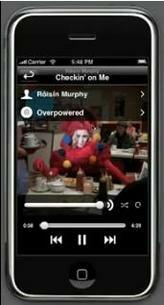 Spotify has created an iPhone app which uses the 3G network to stream the music. Best of all, you can even cache playlists whilst you’re in a WiFi area, for listening to when you’re not in a 3G coverage area. But since it renders the iTunes store all but obscelete, there’s much talk about whether Apple would ever actually ok such an app to be sold through their store. The closest app currently available is the last.fm application, but that one doesn’t allow you to specify your own playlist, just the kind of music you’d like your radio station to play. It’s also rendered useless as soon as you’re not in a 3G area. Will it happen? Could it happen? Watch this, and many other, spaces. Check out Tech Digest for a video of the application in action. then again… Spotify is restricted to wi-fi……..